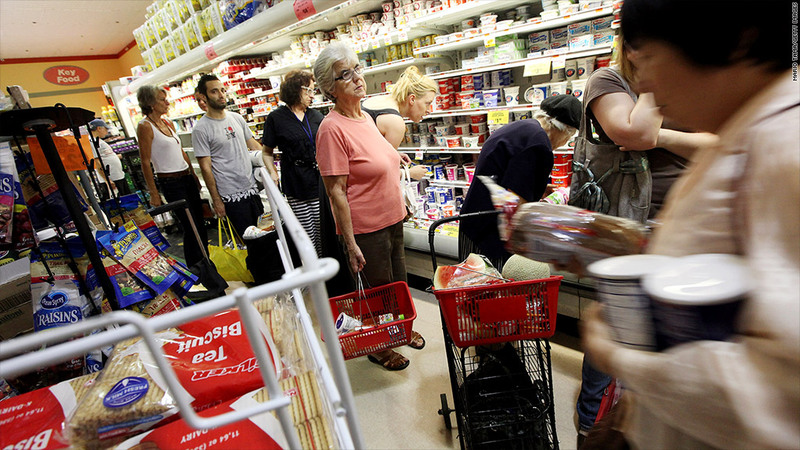 Inflation remained tame in October, as gas prices fell during the month. The Consumer Price Index, which measures a broad basket of consumer goods, showed prices rose 0.1% in October, according to the Bureau of Labor Statistics. Year-over-year, prices were up 2.2%. "The message of the CPI report is that overall inflation remains quite subdued," said Sal Guatieri, senior economist at BMO Capital Markets. "Gasoline prices have eased off and food prices are not rising as quickly as we would have thought in response to the Midwest drought." Falling gas prices were one of the biggest factors subduing inflation. At the end of October, the national average for a gallon of unleaded gas stood at $3.52, down 26 cents from the end of September, according to the AAA Fuel Gauge Report. Meanwhile, food prices rose 0.2% in October and are up 1.7% from a year earlier. Economists often prefer to look at an inflation rate that strips out volatile gas and food prices. That measure, called core CPI, rose 0.2% in October. Year-over-year, core CPI was up 2%. Shelter prices, excluding energy, rose 0.3% in October, the largest monthly increase since 2008. "There is some modest upward drift in rents," Guatieri said. "I don't think it's too worrisome yet, and it's reflecting a tightening rental market and improving housing market." Apparel prices rose, medical prices remained flat, and prices for both new and used vehicles fell. Tamer inflation leaves the door open for more action from the The Federal Reserve. Although the Fed looks at a separate measure of inflation -- the personal consumption expenditures index -- that rate also shows prices are rising only modestly. As of September, PCE prices were up just 1.7% compared to a year earlier, below the Fed's annual inflation target of 2%. "That's important for the Fed because as long as inflation remains in check, it can throw everything it has at accelerating the decline in the unemployment rate," Guatieri said. Minutes from the Federal Reserve's last policy meeting, released Wednesday, show some officials are in favor of launching more asset purchases, after a current policy known as Operation Twist ends in December.